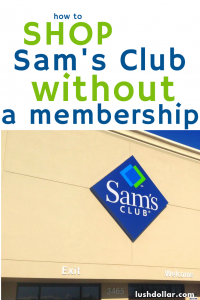 As you probably already know, shopping at Sam’s Club isn’t free as it’s a warehouse club designed for members only. 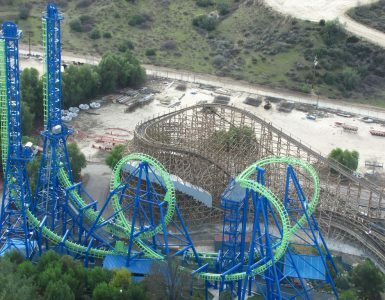 However, this doesn’t mean you have to spend $45 on a basic Select Club membership or up to $100 for a Select Plus card. Yes, there are ways to shop for free and bypass these membership fees, and best of all — it’s legit and 100% legal! In today’s post, I wanted to share multiple strategies that I have used and even researched online that allows you to shop at Sam’s Club for nothing. I also wanted to share some tips you can use to save on a membership as well if you do decide the club is worth it and you want to purchase a membership after all. 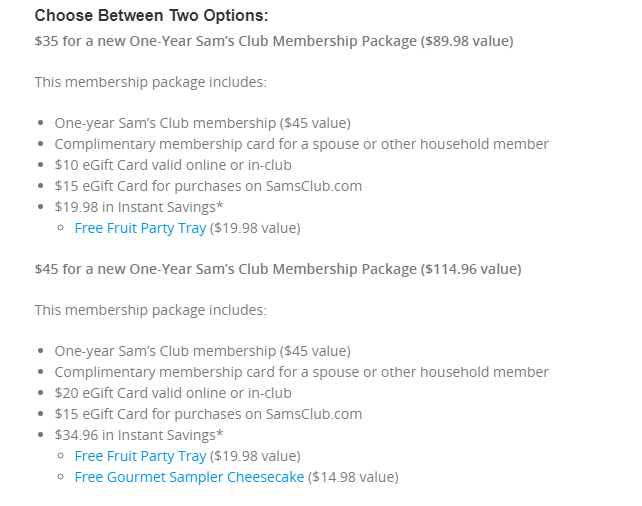 Sam’s Club always offers a free Sam’s Club one day pass to the public, which you can print directly from the official website or simply show your phone at guest services by clicking on the PDF. If you don’t want to shop in store, the guest pass also allows you to make purchases online, but to use it, you will need to create a guest membership, which can only remain active for 24 hours. For those who do decide to download the one day pass, there are restrictions to keep in mind. For one, you cannot take advantage of the Club Pickup, a benefit which allows you to shop online and then go to the warehouse to pick up your order. Secondly, you cannot use the SamsClub.com auction site, which lets you bid on closeout items. Not a big deal, but you can find some pretty good offers if you check often. And lastly, maybe the most important tip is that guests who do use this pass will be charged a 10% premium on their orders, with the exception of California, South Carolina and Elmsford, New York. Keep this in mind when doing your shopping. Using the Sam’s Club one day pass is extremely easy. Just follow this link, print out the PDF or show it on your phone, and then take it to the customer service desk to receive your pass. Once activated, you can use it for the next 24 hours. Since 2018, Sam’s Club has been expanding its offering via Instacart, which is a home-based delivery service. 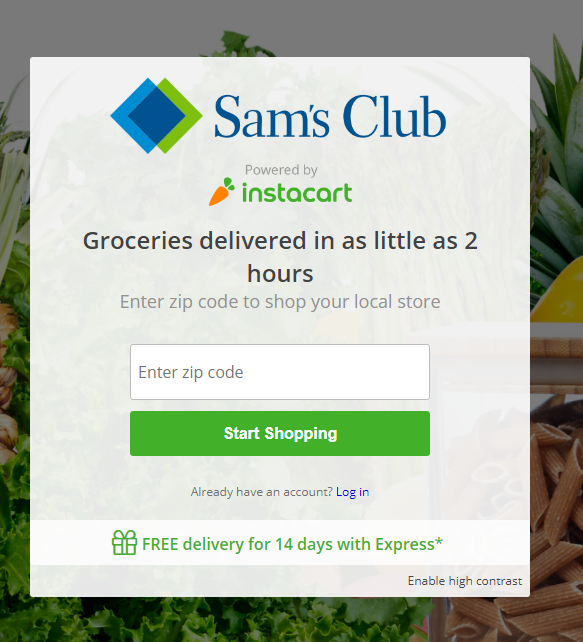 And if you’re an Instacart member, you can shop Sam’s Club via their website and have the items delivered to your doorstep, all without the need of a membership or visiting the store. To see if Sam’s Club serves your area, simply head to the official Instacart website, insert your zip code and then see which stores are available. If it is, then, again, you can start shopping without a membership and have the items delivered to your door within a few hours! And don’t be discouraged if Sam’s Club isn’t currently available in your market since they continue to add stores throughout the year. One big perk of the Sam’s Plus card is that you can get $10 back for every $500 you spend, up to $500 a year. And if you think you can spend more than $5,000 a year, then your membership will technically be free! Now, I know you’re thinking this is a lot; however, if you share your membership or use it whenever you know someone is shopping, it’s not that hard to average $416 a month. If you spend $200 a month and find some friends to do the same, then reaching the $5,000 is incredibly easy and essentially makes your membership 100% free. And if you spend more than the $5,000 a year, you will essentially get paid to have a membership. You can read more about the perks here. 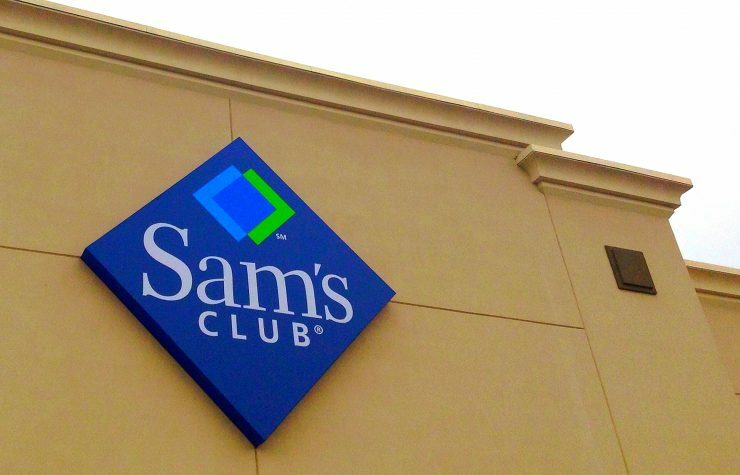 In conclusion, if you think you can spend $5,000+ a year at the club, then I would say this is one of the best ways to shop at Sam’s Club for free. This tip is pretty simple and all it requires is a current Sam’s Club member. The next time they plan on going shopping, ask if you can kindly tag along or meet at the store to do your shopping. Once done, split the bill and be on your merry way. If taking advantage, however, limit your trips to once or twice a year. All members are entitled to one free household membership in which they share. 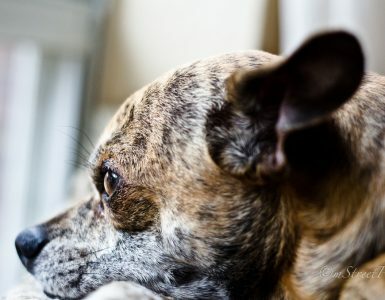 And while it seems iffy as to if that member has to live in the household, it doesn’t hurt to ask a current member if they are willing to give you a complimentary card. If you’re able to snag one, great! This way, you can shop just as if you were a member since you will have your own card. Sam’s Club commonly holds what’s known as an “Open House” event, and during this event, you can attend the club without the need for a membership. In the past, for example, non-members could shop and wouldn’t have to pay the 10% surcharge, but you would still need to go to the Member Services desk for a temporary card. While the dates are quite random, here’s a trick you can use to figure out when you can take advantage. First, you’re going to want to set up a Google alert via Google.com/alerts. In doing so, you can be alerted when Sam’s Club holds their next open house in which you can take advantage of. When alerted, just mark your calendar and be sure to show up on the valid dates to shop for free without the surcharge. In the past, I was actually able to get a free Sam’s Club membership by using my American Express credit card and the only reason I knew was due to the hot deals website, Slickdeals. 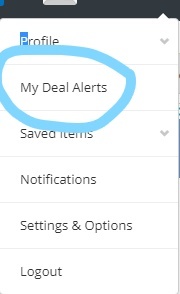 What I like about Slickdeals is that you can set up deal alerts just like the Google Alerts noted above. 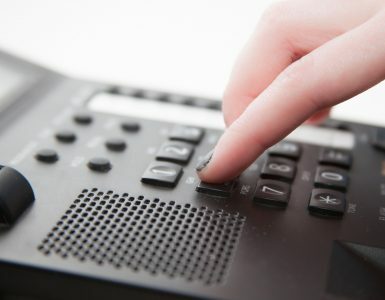 But instead of searching for an Open House event, you will want to set up an alert for “free Sam’s Club membership” or Sam’s Club in general if you want to save on a membership purchase. That way, again, you can be alerted in the case a freebie does pop up. Now keep in mind free memberships are extremely rare, but deals for new memberships pop up all the time. For example, when I was writing this, new members could get a new membership, plus a gift card on Groupon, for $35. At the same time, Discover cardholders could get a $5 a month bill credit when you purchased a Sam’s Club membership and made one purchase a month. This Discover deal essentially made the membership free. Again, these deals pop up all the time, so I recommend you either set up an alert and/or make it a habit to check the website daily. First, register for an account on the website. It’s free. From there, either add “Sams Club” or “Free Sams Club,” whichever you want to be alerted about. If you’re interested in a free membership, then I would recommend you use the “free” keyword. After you add the alert, you can then be alerted via your email any time a deal matches your alert. You can also edit the alert as well if you only wanted to be alerted when it’s considered a “hot” deal instead of every time a member posts a Sam’s Club-related offer. You can learn more about deal alerts here. In most states, it’s against the law to require a membership to purchase alcohol or even prescriptions. And depending on the state you live in, you may be able to purchase alcohol and/or prescriptions without the need for a membership. However, if you want to take advantage of this loophole, do keep in mind that you can only buy the alcohol and/or prescriptions and nothing else. As a Sam’s Club member myself, you DO NOT need a membership in order to use the food court. So if you think you need a membership to order a pizza, hot dog, soda or cheeseburger, don’t fret! Just head to the counter, place your order and swipe your card. Eating at Sam’s Club does not require you to swipe and/or show your card. Unlike Costco, which pretty much demands to see your card as you enter the door, Sam’s Club does not require you to flash your membership card. I even confirmed it with a greeter just the other day. Apparently, it’s a new policy. This can be great for a few reasons. For one, it gives you the chance to browse the store and see if anything is of interest. That way, if you were thinking about buying a membership, you can justify it if you see enough items you want to purchase. And secondly, it’s a great way to touch upon the point mentioned earlier — the food. So if you want a bite to eat, just head through the doors and go straight to the food court. It shouldn’t be a problem at all. Sam’s Club does note that you DO need a membership to purchase contact lenses or eyeglasses; however, if you want to see the doctor, then you can do so without a membership. While there’s no great advantage to this since you cannot purchase the lower-priced glasses, but it could be something of value if the doctor is highly rated. I already mentioned it once, but I will mention it again. Make sure you check out Groupon as the company is ALWAYS offering heavily discounted Sam’s Club membership deals. For instance, when I was writing this, you could get a membership, $10 eGift card, $15 online card and a free $19.98 fruit tray. While this deal may not be available at the time you’re looking to make a purchase, it doesn’t hurt to check. There are quite a few ways to take advantage of a free Sam’s Club membership if need. If you only need to shop around once, then I highly recommend the one day pass, but if doing so, just make sure the 10% surcharge makes sense. Or as another route, consider finding a family member or friend who plans on shopping in the near future and ask them to join. However, I would only consider this route if you plan on doing it once or twice a year. Don’t be annoying and ask weekly! Lastly, while the word “free’ is always nice, Sam’s Club membership deals are always active, so if you’re a new member or you haven’t re-applied in a long time, then I would just recommend checking out Groupon or even eBay to see if you can snag a free gift card, making the deal even sweeter. In most cases, after the promotions, you can get a membership for less than $20 for the year. 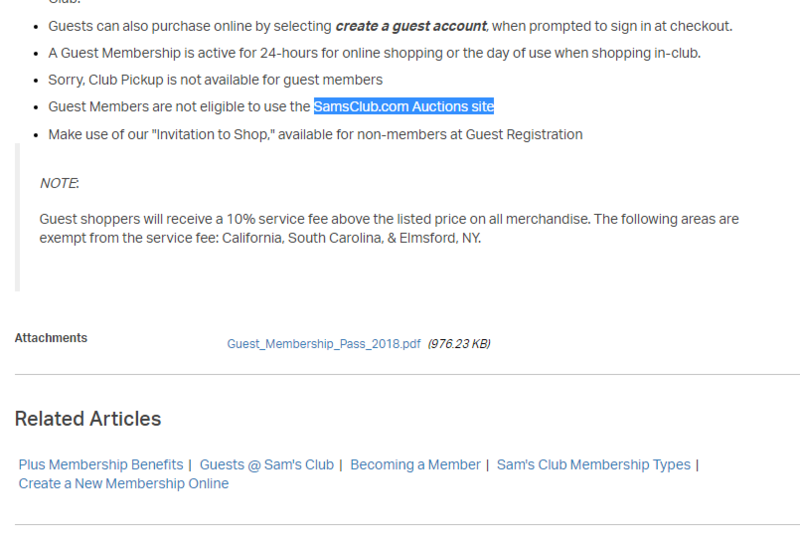 Worst case, if you find out that you regret making the membership purchase, Sam’s Club will give you your membership fee back if you’re dissatisfied. If you know of any more tips, let me know as I would love to add them!